The Cadence® vManager™ Metric-Driven Signoff Platform is a first-of-its-kind automation platform for verification planning and management. The vManager platform is a true enterprise-class solution fueled by client-server technology, a commercial SQL database, and an industry-standard enterprise API, all of which mean scalability for small to ultra-large verification projects. The heart of the functional verification process is the verification plan (vPlan), which back-annotates results to a live plan (executable), and defines verification complete. With the vManager platform, you can improve your design quality while benefiting from improved productivity, predictability, controllability, and coordination of your functional verification process. The vManager platform can execute pre-silicon verification testing with Cadence’s Xcelium® Parallel Simulator, JasperGold® Formal Verification Platform, or Palladium Z1® Enterprise Emulation Platform. The vManager platform lets you easily define and execute your own tests or tests written for you from the verification engineer, and collaborate with your verification team in real time, sharing test cases and doing root cause analysis. Tests can be based on the Xcelium simulator or the JasperGold platform, using the vManager platform to share results. The vManager platform is the ultimate experience to directly measure functional progress and drill down to bin-level details of the unified coverage database (UNICOV) with the embedded Integrated Metrics Center (IMC). The vManager platform can optimize the farm with ranked tests and smart regressions. Post-execution, the vManager platform will aggregate and merge coverage across engines to see a single result, and intuitively organize verification plans by features to maximize comprehension and reporting visibility. 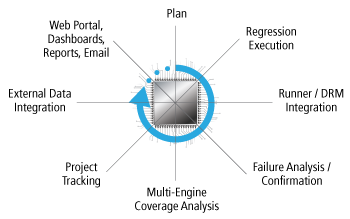 A single cockpit provides execution to results starting from FMEDA plans, to optimization techniques using formal engines, fault campaign execution of hundreds to thousands of faults in parallel, and traceability and reporting per ISO 26262 guidelines. The vManager platform provides the automation for aggregating and reporting results, based on real project metrics. Enabled by data congruency across the Cadence Verification Suite, the vManager platform tracks projects and subprojects individually, and aggregates results to a single unified view. It tracks progress, compares to goals, and provides a simplified web-based dashboard for easy viewing and measurement of milestones. With the Incisive vManager solution and MDV methodology, we significantly improved our large-scale integration verification process by adding automation to capture missing test cases and progress management. The Incisive vManager solution has been very well accepted by our design and verification teams because it’s really straightforward, intuitive, and easy to use. The Incisive vManager solution helps us with project visibility, which improves our verification productivity. The new Incisive vManager solution allows us to merge and analyze our latest cores’ databases on a scale never before possible, improving our productivity and providing faster time to market.